There are no such forces amongst those registered for the No campaign – quite the reverse. The official ‘Better Together’ Conservative, Lib-Dem and Labour coalition is united, not only in its support for the Union, but also for continued austerity, wars and occupations, and for Trident. And that is the ‘liberal’ wing of the No campaign! Beyond them lie Farage’s anti-migrant, anti-welfare, chauvinist, misogynist and homophobic UKIP. Well, UKIP is not officially registered for the No campaign, but this doesn’t appear to have stopped them holding a rally tonight. The bigoted Orange Order, with which UKIP has strong links in both Scotland and Northern Ireland, has officially registered though. So has Britannica, formed by Charles Baillie, former Glasgow organiser of the racist and Loyalist supporting BNP. The main difference between ‘Better Together’ on the one hand, and UKIP and the Orange Order on the other, is that the former accept the current ’New Unionist’ political settlement, whilst the latter don’t. ‘New Unionism’ is designed to preserve British ruling class rule and influence throughout these islands. The combination of the ‘Peace Process’, which covers the whole of Ireland, and ‘Devolution all-round’ for Scotland, Wales and Northern Ireland, has created the optimum political conditions for corporate businesses to make profits here. Both British and Irish governments have imposed draconian austerity measures to ensure that such conditions are maintained. At the very last minute, faced with the real prospect of a ‘Yes’ vote, the Conservatives, Lib-Dems and Labour, fronted by Gordon Brown, have been desperately trying to cobble some prospect of a new Federal/‘Devo Plus’ deal, to maintain the ‘New Unionist’ settlement. This, of course, depends on people voting ‘No’. Even if these parties could come to some agreement over the new powers to be devolved, this would amount to very little in practice. However, such an agreement depends on the same current tacit Conservative/Lib-Dem/Labour anti-independence, pro-austerity, pro-Trident alliance still being in place after the 2015 Westminster election, whichever party or parties actually go on to form the next UK government. Next month, after the Scottish referendum, Douglas Carswell MP, who has defected from the Conservatives to UKIP, looks like taking the Clacton seat with a big majority. With the focus once more on Westminster politics, Scotland would soon be forgotten if there were to be a ‘No’ majority. Cameron would move even further right to stem a likely haemorrhage of Tory MPs to UKIP. And the one thing that the Tory Right, including the most likely future party leader, Boris Johnson, is opposed to, is even the most minimal ‘concessions’ for Scotland. They believe that Cameron made a big mistake in allowing such a referendum to take place in the first place. Scotland must be punished. No more devolved powers and scrapping the Barnett Formula are their starting point. UKIP has attracted many of those on the Tory Right who opposed and have continued to oppose the very existence of the Scottish and Welsh devolved parliaments. Furthermore, as the only all-British party with representation in Northern Ireland, they have learned from the Unionists and Loyalists how to subvert such bodies. All three new UKIP Northern Irish councillors are members of the Orange Order. David Jones, their Portadown councillor, was the press officer for those involved in the notorious Drumcree protests which led to the death of three young children burned alive in their Ballymoney home in 1998. More recently, Loyalists have been conducting a campaign of fire-raising and intimidation following the decision of Belfast City Council to fly the Union Jack only on certain days. The Progressive Unionist Party (which fronted the Loyalist paramilitary Ulster Volunteer Force) is the driving force behind this campaign, but its aims are supported by the Traditional Unionist Voice (TUV). It wants to reassert Unionist supremacy in Stormont. The TUV is very similar in its politics to UKIP. Noel Jordan, the new UKIP councillor for Carrickfergus, thanked TUV and PUP supporters for the transfer votes that contributed to him being elected. And a short jump across the North Channel, here we find UKIP’s Scottish Chair, Arthur ‘Misty’ Thackeray. The nature of his politics can be gleaned from his comment about Glasgow City Council, the letters of which he claimed stand for “Gays, Catholics and Communists”! ‘Misty’ is organising tonight’s UKIP rally. David Coburn, who was elected as their Scottish MEP, is a carpetbagger candidate imposed by the London office. For the wider public, UKIP needs to hide its Orange Loyalist connections in Scotland, and their gay MEP is a useful front. 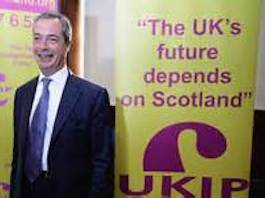 However, although UKIP’s Euro-election performance in Scotland was much poorer than in England and Wales, it managed to gain third place in those constituencies with an Orange Order presence. Scotland is UKIP’s bridge between the current Loyalist anti-Irish front-line defence of the UK in Belfast, and its wider British chauvinist, Islamophobic aims in the UK. There can be little doubt that some of those attending the UKIP rally tonight in Glasgow will be at the Orange Order march in Edinburgh tomorrow. However, there is another aspect of these two events, which should be of concern to ‘Yes’ supporters. A couple of weeks ago an unnamed ‘No’ spokesperson raised the prospect of “absolute carnage” on the actual day of the referendum. Not surprisingly, this was met with absolute derision from the ‘Yes’ campaign. All those involved in the registered ‘Yes’ campaigns have conducted open public campaigns throughout Scotland promoting the very best traditions of democratic debate. They have often invited ‘No’ speakers to put their case, something which has not been reciprocated by the ‘No campaign’. It has already been shown that in relation to their support for the basic nature of the UK, which ‘Better Together’, UKIP and the Orange Order’s are trying to defend, there is much in common between them. And when it comes to the Tory Right and UKIP, there is now a slippage from the Tories to UKIP in personnel. There is also an accommodation to UKIP, particularly over migration and benefit seekers, not only by the Conservatives, but by Labour too. Blue Labour represents UKIP-Lite for the working class. It is much more powerfully placed at Shadow Cabinet level, than the now absent Labour Left. The Labour Party in Scotland still has MPs as hostile to the devolution legacy as the Tory Right and UKIP – Jim Hood and Ian Davidson spring to mind. 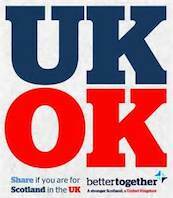 Nevertheless, ‘Better Together’ would like to put some public and clear ‘red, white and blue’ water between themselves and UKIP and the Orange Order. Any links between the wider ‘No’ campaign and these two organisations are therefore likely to be through the UK security services, whether the police or MI5. This was how the UK state operated in Northern Ireland, colluding with Loyalists, beyond any public scrutiny. This also meant that the public political face of Unionism could distance itself from the attacks conducted by Loyalists on behalf of the UK state. ‘Better Together’ would probably have preferred it, if neither UKIP nor the Orange Order were making a public appearance this weekend. However, there is a way this could be turned to the advantage of the ‘No’ campaign. These two events are deliberately provocative, and it would certainly suit the ‘No’ campaign if ‘incidents’ could be created, which contributed to the violent image the ‘No’ campaign now wants to conjure up. This is where the state can provide a helping hand. Their behind-the-scenes operations are covered by the UK’s Crown Powers. Politicians can deny any public knowledge of them, precisely because they are not necessarily consulted. The Orange Order knows all about intimidation. 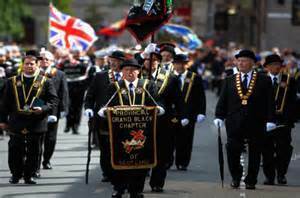 The Glasgow Orange Defenders Flute Band, which will be present tomorrow, marched earlier this year in Belfast. It broke the agreement that marchers remain silent as they passed St. Patrick’s Catholic Church. There will also be bands across from Northern Ireland, steeped in the tradition of asserting Protestant supremacy. And, it doesn’t need much to provoke an Orange march. This July in Glasgow, a 12 year boy, who was merely watching a passing Orange Parade, was struck by a bottle. UKIP has also attracted its own unsavoury would be ‘protectors’ from the ranks of ultra-Loyalism. This is why all Yes campaigns have made a call to all supporters to go nowhere near these two events. This call has gone out from ‘Yes Scotland’, the Radical Independence Campaign (RIC), the James Connolly Society (http://107cowgate.com/2014/09/02/jcs-statement-on-orange-orders-independence-referendum-march/) and on the Bella Caledonia blog (http://bellacaledonia.org.uk/2014/09/01/keep-the-peace-and-avoid-potential-flashpoints-the-worlds-media-will-be-arriving-soon/). RIC has taken a further step. 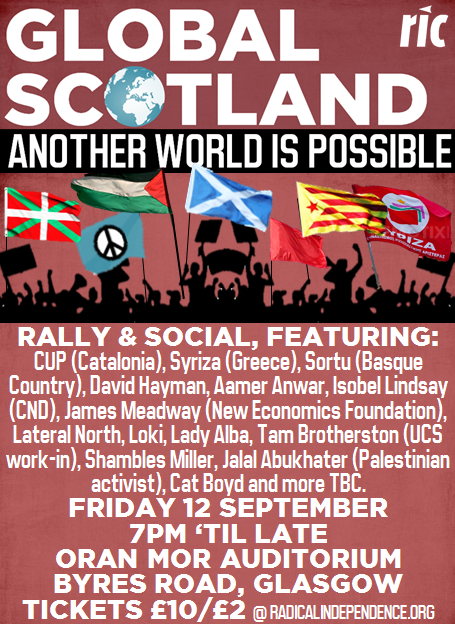 It has organised a weekend of activity in Scotland around the theme, Global Scotland, Another World Is Possible. People have been invited from England, Wales, Scotland and Ireland to help us win a ‘Yes’ vote. The UK state, with the backing of ‘Better Together’ provides constitutional underpinning for such reactionary organisations as UKIP and the Orange Order. An independent Scotland could be the first step in breaking from their British chauvinism, sectarianism and racism, from their war-mongering and austerity. Our campaign is not Scottish nationalist, but is the Scottish internationalist link in the struggle for another world based on equal democratic, economic and social justice. I hope you will enjoy reading this piece.